Carole Whiteley from Mintcake Digital is competing in this years London Marathon and she needs your support to raise as much money as possible! 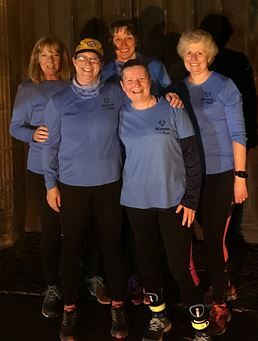 Carole is fundraising for the charity Mind and is one of 5 local athletes from Kendal running club, Women on the Run who have successfully gained a place in the 2019 Virgin London Marathon. Only Karen has previously completed a marathon and all 5 are deep into their training schedules and fundraising efforts. The 2019 London Marathon takes place on Sunday April 28th. As part of their fundraising the 5 women have organised a virtual challenge. The challenge is to run, jog, walk (or dog-walk!) or swim a Marathon distance (26.2 miles) or Half Marathon distance (13.2 miles) between 1st April 2019 and 30th April 2019. Once completed, you can upload your evidence to receive your Medal and Certificate plus a free entry into a prize draw! There is also a prize for the participant who completes the furthest distance on foot during April. You can complete this in one attempt or break the distance into parts. Registration is open now and costs £12.50 for adults and £7.50 for children. All proceeds will be split between the 5 charities. Please note that registering means you get an entry to the challenge. You only gain the medal, certificate and entry into the prize draw when you have completed the challenge and submitted your evidence in the time frame. Good luck to Carole and all 5 ladies – we’ll be cheering them on!